An octopus is a cephalopod mollusc of the order Octopoda. It has two eyes and four pairs of arms and, like other cephalopods, it is bilaterally symmetric. An octopus has a hard beak, with its mouth at the center point of the arms. An octopus has no internal or external skeleton (although some species have a vestigial remnant of a shell inside their mantles), allowing it to squeeze through tight places. Octopuses are among the most intelligent and behaviorally flexible of allinvertebrates. 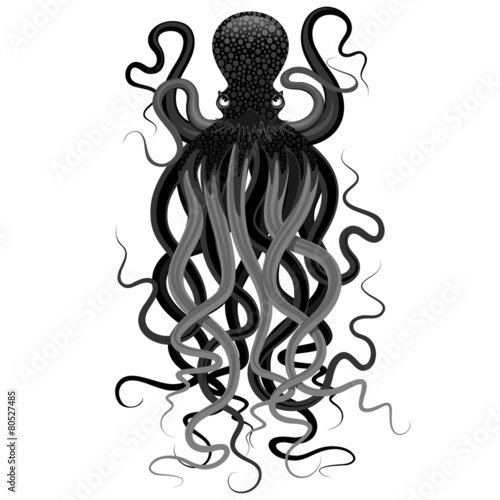 This entry was posted in Illustrations / Designs Copyright © BluedarkArt and tagged #blogger, #blogs, 4sale on fotolia, animal, animal art, animals, art, blog, bluedarkart designer, bluedarkart on fotolia, cephalopod, design, graphic art, mollusc, ocean life, octopus, octopus vector graphic art, sea life, vector art, vector graphics by bluedarkart, vector octopus by bluedarkart. Bookmark the permalink.